Happy birthday Betty Miles (The Real Me), Caroline Arnold (The Terrible Hodag and the Animal Catchers), Deborah Nourse Lattimore (Cinderhazel), and Bruce Coville (Jeremy Thatcher, Dragon Hatcher). It’s the birth date of Margret Rey (1906-1996), Curious George series. In 1866, U.S. Congress eliminates the half-dime coin and replaces it with the five-cent piece, or nickel. Read The Buffalo Nickel by Taylor Morrison and A Nickel, a Trolley, a Treasure House by Sharon Reiss Baker, illustrated by Beth Peck. It’s Love a Tree Day. Read A Tree is Nice by Janice Udry, illustrated by Marc Simont. May has been designated both Personal History Month and Latino Book Month. 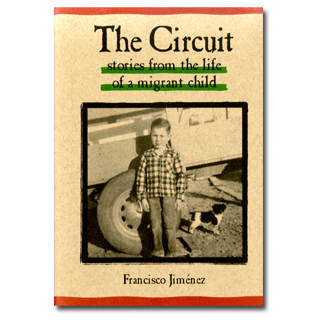 Both experiences can be found in one of the most remarkable autobiographies of the last twenty years, Francisco Jiménez’s The Circuit: Stories from the Life of a Migrant Child. Now a university professor, Jiménez began his journey toward United States citizenship as a child when he and his family were illegal immigrants and migrant workers in California. In the The Circuit, he explores his own story, showing it through the eyes of young Francisco. That life begins as he enters the United States, “Under the Wire,” and ends with the immigrant guard (INS) removing him from his eighth grade classroom for deportation. In between, the family constantly moves around searching for work. Francisco struggles with English and has to repeat first grade because he does not understand anything his teacher says. Yet nothing in these chapters, which work independently as single stories, even hints at bitterness or anger. All contain moments of grace, where good things happen to the family. Francisco begins to work at age six. Despite his manual labor responsibilities, he finds himself fascinated with books—and he ultimately learns to master English. Francisco, his parents, and seven siblings live in tents or shacks. Yet even in these cramped conditions, he enjoys the simple things of life like playing guessing games or listening to ghost stories. Francisco continued his saga in Breaking Through and Reaching Out. Eventually, his family returned legally to the United States, and he became the embodiment of the American dream. Perfect for use with ESL students, The Circuit explores the migrant experience and showcases an appealing young boy with a strong work ethic. For thoughtful ten- to fourteen-year-old readers as well as adults, this book can alter the way they look at current headlines and even their own lives. Often during recess I stayed with the caterpillar. Sometimes it was hard to spot him because he blended in with the green leaves and twigs. Every day I brought him leaves from the pepper and cypress trees that grew on the playground. Just in front of the caterpillar, lying on top of the cabinet, was a picture book of caterpillars and butterflies. I went through it, page by page, studying all the pictures and running my finger lightly over the caterpillars and the bright wings of butterflies and the many patterns on them. I knew caterpillars turned into butterflies because Roberto had told me, but I wanted to know more. I was sure information was in the words written underneath each picture in large black letters. I tried to figure them out by looking at the pictures. I did this so many times that I could close my eyes and see the words, but I could not understand what they meant. Originally posted May 16, 2011. Updated for . This wonderful book pairs well with another you recently featured: Esperanza Rising and also Will Hobbs’ book Under the Wire. I once taught a unit on immigration and assimilation and used these, among others about other cultures, for literature circle choices. I love the rich discussion novels add to a social studies unit. Sarah: Thanks for tying these two books together, along with mentioning the Hobbs. One of the aspects of this book that moved me was the idea of “home.” This is a book about migrant workers, who constantly move, who live in termite-ridden garages, cars, tents and barracks, whose first house with a wooden floor burns down. Yet wherever they move, they create is a home. The protagonist Panchito actually has a lump in his throat when he leaves one of his shacks. It makes the reader understand that what constitutes a home is not necessarily the physical building but the people and community. Since it’s Love A Tree day, you may want to try Our Tree Named Steve by Alan Zweibel. I loved sharing it with my children! I was so moved by this book, in all the right ways. After I finished it, I started watching a couple of the students in my volunteer classroom, who I knew had joined the class roster late and who had spotty attendance records. It made me so much more aware of the challenges facing students in classrooms here and three-fold for my students back in Washington State, where migrant communities exist in every part of the state. When I reread this book not too long ago, I was struck by the realization that this wasn’t a story of despair. It was a story of challenges and small triumphs and uncertainty but not of failure or hopelessness. I was moved and inspired all over again. I read this book in its Spanish translation to my first-graders, most of whose parents worked in the lettuce, broccoli, or strawberry fields. They loved it. While looking for metaphors to describe the work my father did as a Foreign Service Officer, one of the ones I came up with was “La Migra.” Because he had to migrate short term for his work, taking his family with him. It’s an incomplete metaphor, of course. But the truth is, when you move around a lot, home becomes “where the heart is,” instead of a geographical location fixed. I will definitely look for this book. I loved this book and its sequels. What struck me was the incredible sense of family: family as the foundation of all strength. So powerful without being overly sentimental, this is such a perfect book for students. It’s short enough not to overwhelm reluctant readers, and packed with enough discussion material to mirror any lengthy novel. This is a fantastic story that gets deep into characters’ emotions in a short amount of space: a major feat for any author.